Selecting the right bicycle for your needs will involve choosing both its type and its size. Click for a short explanation of bicycle sizing. 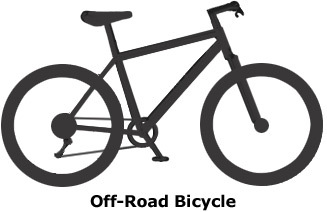 Regarding type, most used bicycles fall into several major categories defined by where and how the bikes are ridden. 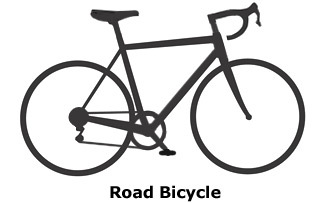 Road bikes are designed to be ridden on roadways and other hard surfaces. Although they can be used on non-paved recreational trails like the Katy Trail, features that add to their on-road efficiency are sometimes a drawback in these environments. Recycled Cycles subcategorizes its road bike inventory into three sections. Listings within these sections that carry a "RETRO" tag include classic older models and special editions manufactured during the 1970s and '80s. Many feature collectible brand names and unique designs made popular in the past few decades. Sport bikes or "sport tourers" are a top choice for short and medium-length day rides. Their light weight, responsive frames and narrow- to medium-width tires make them fun to ride. Most sport bicycles have downturn handlebars, although some riders prefer flat, MTB-style bars. Triple chainwheels make many sport models easier to ride uphill. Racing and triathlon bikes are built for performance. Lightweight materials and construction, fairly narrow tires and tight frame geometries make them light and agile -- and still a great choice for spirited day rides. With the addition of aerodynamic handlebars, most racing bikes are suitable for casual triathlon use. Triathlon-specific bicycles, however, often have radical seat positions and other unique features which can make them less suited to general use. Off-road bikes were originally designed to be ridden away from roads, but popular use also saw their owners taking short road rides. Advances in material and equipment have resulted in the development of more specialized bikes within this category. Mountain bikes are user-friendly vehicles with wide tires, upright handlebars and extra-wide gear ranges. Although often used on roads, MTBs meet the demands of true off-road riding with sturdy construction, special componentry and, increasingly, suspension systems. Cyclocross bikes are a specialized breed of off-road racer. With fairly narrow wheels and downturn bars, they resemble road bikes, but have stronger brakes and other heavy-duty, MTB-style features. Similar bikes known as "gravel grinders," designed for use on unpaved surfaces, are also listed here. Hybrids and their close relatives, comfort bikes, are well-suited to short, casual rides on recreational trails or roads. They have upright handlebars, wide tires, wide saddles and wide gear ranges. Most comfort bikes also have suspension features. 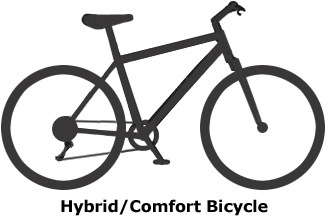 Often lacking suspension, hybrids are usually lighter than comfort bikes and offer greater on-road performance.